Premenstrual syndrome (PMS) refers to the range of psychological and physical symptoms many women experience in the days prior to a period. The more serious form of PMS is known as premenstrual dysphoric disorder (PMDD). Here we will discuss the symptoms, causes and treatments of this very common disorder. PMS is characterised by physical and emotional symptoms experienced in the days leading up to a period. It has been estimated that up to 80% of women experience some form of PMS. Symptoms are moderately severe in about 30% of women and disabling in 2-9%. These symptoms start anywhere from four to ten days prior to a period and stop after bleeding begins. Symptoms vary from woman to woman and can change from cycle to cycle. No one is entirely sure why some women develop PMS. There appears to be some very complex interactions between certain chemicals in the brain and progesterone that lead to the symptoms. Other factors include stress levels, poor physical health, genetic predisposition, cultural and social environment, as well as high body mass index (BMI) and smoking. Importantly, PMS is different from depression. Although many of the symptoms are similar, PMS resolves with the onset of menstruation whilst depression does not. PMS needs to be distinguished from underlying depression because the treatments are different. There is no diagnostic test for PMS. 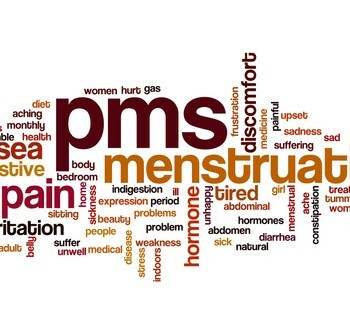 Daily charting of symptoms over two or three consecutive menstrual cycles can be very helpful to determine the pattern of events, and will help to differentiate PMS from underlying depression or anxiety if there is any doubt. PMDD represents the very severe end of the PMS spectrum. It affects about 3-8% of women. Women with PMDD have severe emotional and physical symptoms to the point where they simply cannot get on with their daily lives in the days leading up to a period. It is a serious condition that interferes with personal relationships, employment and mental health and can quite simply rule the lives of those affected. PMDD has a quite specific treatment and it’s important it be distinguished from both PMS and other conditions like depression or anxiety. If you’re concerned, discuss your symptoms with your doctor. How can PMS be managed? Physical activity increases endorphins – they make you feel good, act as natural painkillers, and help you feel more relaxed and in control. Any form of physical activity is fine – choose something you enjoy and aim for 30 minutes of moderately intense activity on most days, especially those when the symptoms are the worst. Everything is harder to cope with when stressed. If stress is a significant factor in your life, consider professional counselling as studies have shown this can help with PMS. Reduce caffeine intake, especially if breast tenderness is a problem. Try drinking 6-8 glasses of water every day. Reduce salt intake to help prevent fluid retention. Get enough sleep, rest and exercise to help manage stress. Consider relaxation techniques like yoga or mediation. Write your symptoms down – it may help you identify things that trigger or worsen your symptoms. If symptoms are persisting and interfering with daily activities see your doctor or ask for a referral to a gynaecologist with expertise in PMS. It is important that other possible causes of the symptoms are excluded and there are a range of medical interventions, both hormonal and non-hormonal, that are effective in managing the various symptoms of PMS when lifestyle modifications are not enough. Although PMS cannot be ‘cured’ it can certainly be managed and for many women the symptoms can be alleviated completely.